There has been something of a resurgence in realist/representational painting these days. There more than a few ateliers in San Francisco and one can even look at recent philanthropy from Jane St.'s founder. There is a simmering angst amongst realists against the art school-galler-museo-complex. There aren't many galleries that are interested in modern realist art, and some modern "abstract" artists can achieve obscene valuations on works that seem to defy common sense. Realists believe that this is nothing short of a complete scam, a way to slap acrylic on a canvas and press it into dolars. The yields on realist are necessarily far lower, good realism takes time (even with proficient eyes). I'm obviously simplifying a bit in the previous summary. Galleries are surely somewhat justified in there aversion to realist art ("that's a nice figure drawing and all...", how many naked people sitting down can one gallery possibly use?). Some abstract artists have been successfully trained in realism and appear to (passionately) choose exploring visual paintings outside of that training. Realism itself isn't purely mechanical reproduction of the the light falling on the retina, evidenced by its core methods of practice such as the process of breaking a scene down into abstract shapes that cross physical and semantic boundaries. Yes we do have painters like Picasso, who were clearly strong realists before they developed more abstract styles. Realists are sympathetic to artists like him and (I feel) view it almost as a type of illustration. But we then have the Damien Hirsts, Barnett Newmans and Jeff Koons' whom many people (outside of realists) are more than skeptical of. I think that I (and many others) would expect that double blind trials would demonstrate that no one is capable of valuing a piece of modern art (in the genre of the three artists just mentioned); whereas good realist is fairly easy to discern (to a limit, I think the crowd in front of the Mona Lisa is there mostly because it has been conditioned to behave that way in front of it). Compare this to classical music, where experts can easily discern a celebrated player vs. someone who is just very good. A good skpetic's view is presented in Robert Hughes' "The Mona Lisa Curse". So what's the harm? Some rich fools buy an expensive balloon dog and the world keeps turning. Well many people do argue that art education has suffered tremendously, while we do (over) produce a massive force of (skilled) artists employed by the entertainment industry most children leave school without knowing how to draw and don't have any understanding about why some art is valued so highly. So why do we have an modern art market? I have a guess, wreaking a little of conspiracy theory. It is an excellent (though not the only) vehicle to keep wealth around "people just like you". The rules for what constitues a good piece of modern art are not computable, and can change very quickly, and original works (by definition) are not reproducible. This makes it a sort of currency traded amongst wealthy families, not easily forged by lower castes, sequestering and retaining wealth in that circle. It is just a silly idea, but I can't help but feel like there is something to it..I can't come up with another explanation that makes (even a little) sense. I can buy modern art as a sort of weird fiat-currency. I don't understand most contemporary abstract art. When I was in grade school, my best friend's dad's house was adorned with Frank Stella, Robert Rauschenberg, and Larry Bell pieces. I thought they all looked like crap then and I still do. John Pence shows a lot f local realists, there is a new opening once every few months. I can let you know if you are ever interested. There are 4 ateliers in the Bay Area that I know of, BACAA (Belmont), Sadie Valeri's (city), Safehouse (city) and one in Oakland whose name doesn't come to mind. So when can I quit my day job? My newest piece. this, i understand. and i sort of like it. > this, i understand. and i sort of like it. 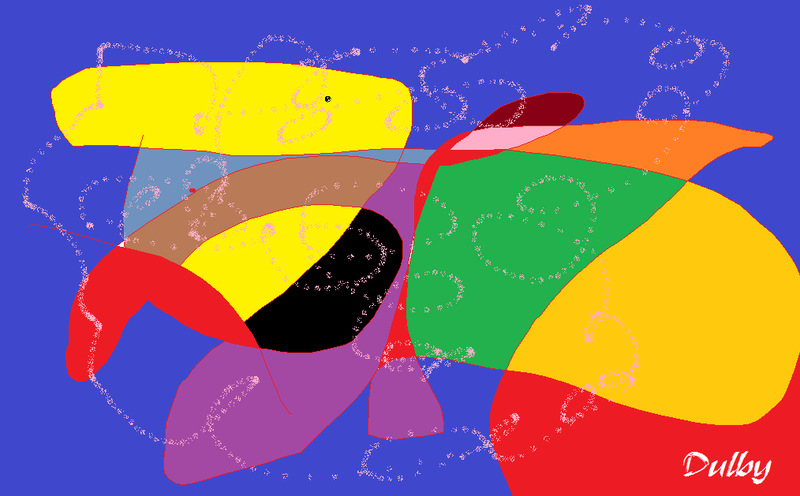 @I don't understand most contemporary abstract art. Don't try to understand it. Experience it. I'm not terribly knowledgeable here but doesn't expensive art carry pretty badly? So either you're purchasing for a lot of edge (which seems maybe possible since markets are reasonably inefficient / opaque) , you're able to somehow lever tax inefficiencies so that the above issues are moot, you simply LOVE the piece and don't care, or you're up to some shenanigans? If you spend 70.5M on a Cy Twombly and hold it for 3-4 Y, where's your breakeven? "In general, art's risk-return profile is much less attractive than that of financial assets [stocks, bonds etc. ], even before transaction costs. " The puzzle is, then, why is it such a prominent asset class? People buy all sorts of silly things for lots of money I suppose...but it's easier to understand why someone wants a fancy car (that they can be seen in and impress people with) than it is to understand why someone would want an (expensive) painting painted by someone with little skill. If you had 100mio$ hidden on a Swiss bank account and were abandoned by the very robot bankers who robbed you fees throughout the years, your only way to get that money out with decreased risk is to buy art and park it in a free port zone. The recent crack down on these free port zones will probably bring down the average art market. When you buy a $1bn of old cars can you tell me where you put it? Also when you buy $1bn of art you can bequest it to a museum and your name will appear on a wall for a long time. A lot of those guys buying art is so their name stays in stone. You can bequest your cars to a museum. Never heard of parking art at FTZs. ... why not just park gold there? I guess the legacy premium you pay with art collections might be cheaper than buying a university building or public park.. Nothing fishy at all about art and money, nothing fishy at all.